Have you ever thought about how it will be in the New Paradise – the one thousand (1,000) year Reign of Jesus as King – one of Peace? In the Book of Revelation it says: A New Heaven and a New Earth. How will this happen? At the arrival of Jesus Christ in His Second Coming, He will renew the Earth and Heaven, because Heaven and Earth will fuse together. Heaven will be on Earth and the loss of Paradise due to the fall of Adam and Eve, will be regained again. 27th June 2012: (To MDM) – GOD THE FATHER: Today, I reveal to all My children, My future Plans for the New Heaven and the New Earth. When they merge into one Glorious Paradise, there will be Twelve (12) Nations. These Nations will consist of some Nations in the world, who have shown allegiance to Me. Those scattered, will be brought together, to join those other Nations as one, united as one Holy Family. My Twelve Nations are signified in the Twelve (12) Stars on the Woman, in the Book of Revelation. The Woman is the Mother of God and She wears the Twelve (12) Stars to signify two things: The Twelve Apostles helped My Son to set up His Church on Earth. 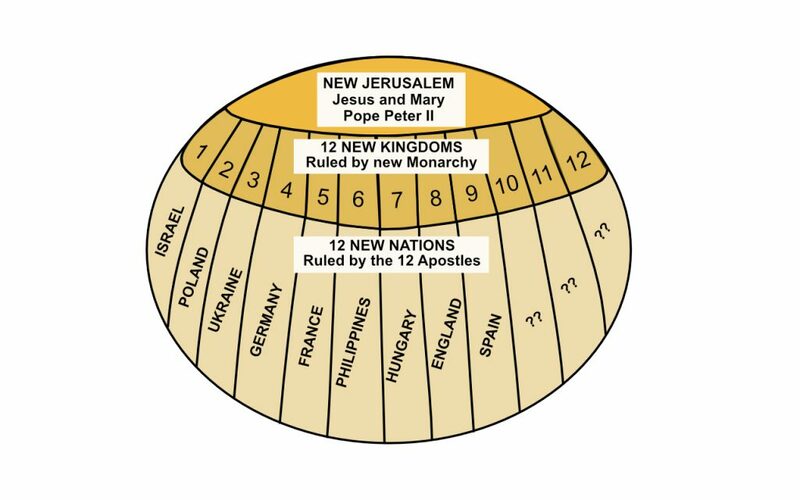 The Twelve (12) especially Chosen Nations will form the One True Apostolic Church on the New Earth, when Heaven and Earth merge as one in My New Glorious Paradise. My Son, King of Mankind, King of the Universe, will reign over My New Paradise on Earth. He will appoint Leaders in every Nation. The Mother of Salvation will also Reign as Queen of the New Paradise. It will be My Son who will place the Crown on Her Head in the New Paradise, as Queen of All God’s Children. 26th June 2012 (To MDM): New Paradise: You will be made of a pure body, incorruptible, free from disease, physical death and aging. You will all have your own dwelling with grass, trees, mountains, rivers, streams and flowers. Animals will be tame and live in peace and harmony with all of God’s children. You will see your children marry, have children and the miracle of families risen from the dead, will be witnessed by all. This resurrection will be like no other joy imaginable. You will be reunited with your loved ones, who passed away in this life and went to Heaven. You will have Nations Twelve (12) – all of which will be governed by Me, with My Apostles and Prophets. As you can see, the New World, which will come with Our Lord’s Second Coming, is so beautiful. At the end of this article, I have drawn for you the world and how it will be. Jesus and Mary showed me this: The New Holy Jerusalem coming down from Heaven, is around forty-nine (49) times larger than New York City – the size of Switzerland. It will have Twelve (12) Kingdoms of the New Twelve (12) Tribes of Royalty, governed by the Blessed Mother. In the New Era there will be no democracy, as this was never from God. But a Monarchy will rule every Kingdom of the New Holy Era, starting with the Blessed Mother. In the New Jerusalem there will be Twelve (12) Kingdoms, as there are Twelve (12) Gates that enter the City. • Large library of the books of every life that entered the New Holy Era from Heaven, Earth and Purgatory. • Schools – Universities etc. In the centre of the New Jerusalem you will have the New Vatican, which will be made up of a Fifteen (15) Decade Rosary of Churches, with the Benedict Crucifix being the main building. It is to be It noted, that every Holy Shrine of Jesus, Mary and the Saints, will be lifted up from the Earth during the Three Days of Darkness, including the Basilicas, the Cathedrals and the Churches, into the New Heavenly Jerusalem. These are some of the Nations who will be represented in the Twelve (12) New Nations: Poland, France, Spain, Philippines, Germany, Israel, Hungary, England, Ukraine and other Nations of which I do not know. But I do know, that every Nation now, will be represented within the Twelve (12) Nations. The New Holy Era will last one thousand (1,000) years. Jesus will Reign as King – the Holy Mother as Queen – and Pope Peter II as the Last Pope. During the one thousand (1,000) years, seventy-two (72) billion babies will be born – no pain in delivery – and shorter pregnancies. Dear children of God, is this not worth fighting for? God will triumph through the Blessed Virgin Mary, though the Remnant Church on Earth. Alleluia to Jesus the Christ, King of the World – united with the Blessed Mother Mary as Co-Redemptrix and Mediatrix of Grace, with the Angels and Saints. 13th May 2012: (To MDM) – My New Kingdom: You will be lavished with great abundance and will want for nothing. “How could I not tell humanity the Truth? 24th August 2012: (To MDM) – Give My Father thanks for the Gift of His Grace of Immunity from the Fires of Hell. Jesus further said: Bring all those souls close to your heart and place them now before the Throne of My Father and in His Mercy He will give you the greatest Gift of all – He will grant salvation. Bring the names of dark souls, including a list of those not known to you. Wishing God’s Blessing to you. Take courage – Trust in the Love and Mercy of Jesus.